Now owned by the Forestry Commission, Grizedale Forest is enchanting and really does seem to cater for everyone. The forest has a number of well defined trails, each walk has a designated colour waymarking sign for you to follow. Choose from gentle strolls suitable for pushchairs and wheelchairs to more demanding all day walks - or for those absolutely bursting with energy and a great head for heights, the Forest is, of course, home to the award winning Go Ape! course. There is a pay and display car park at the Visitor Centre. Ridding Wood is the least strenuous of all the trails in the forest, offering easy access, for everyone to this beautiful forest. The trail is approximately one mile long with around 20 sculptures situated along the way. The sculptures are great fun for younger members of the party, (or those young at heart!). Some of them can be played and some can be hidden in. The Ridding Wood walk is around one mile long and you should allow one hour. Follow the blue waymarking signs. Millwood Trail is ideal for pushchairs and wheelchairs as this circular walk, with views of the Grizedale Valley, is a surfaced path. The trail is an approximately one and a half miles long. Allow one hour. Follow the yellow waymarking signs. This circular trail enables you to walk to the highest point (314 metres) in the Forest and rewards of panoramic views across the Lakeland Fells and of Morecambe Bay. The walk is approximately three miles long and takes around two hours to complete. Follow the red waymarking signs. Grizedale Tarn, the Forest's only natural tarn is found by following the old County Road as it climbs eastwards out of the Valley. This walk is about three and a quarter miles long and you should allow around two and a half hours. Follow the white waymarking signs. The Silurian Way takes its name from the geological period (about a million years ago) in which the forests characteristic grey slate and shale rocks were formed. The Silurian Way is set in the Grizedale Valley and is a great opportunity to admire the 80 sculptures which are exhibited throughout the forest. The Silurian trail is approximately nine and a half miles long and it is recommended that you allow about five hours to do the walk. Follow the green waymarking signs. If you grew up reading Arthur Ransome then you will love this walk. These woodlands near the shore of Coniston Water inspired Arthur Ransome to write Picts and Martys. Remember "Mount Kanchenjunga" you will get a view from it on this very walk! (.. if you have not read the book, Mount Kanchenjunga being The Old Man Of Coniston). This walk is approximately one and a half miles long and will take around one hour. Follow the purple waymarking signs. This circular walk starts from the Machell Coppice Car Park. From Coniston follow the small road south along the east side of Coniston Water. You will find the car park on the left about half way down the lake. Here you have a choice of taking the longer or shorter routes from Blind Lane car park to the Force Falls, the water from which, was once used to power a local bobbin industry. There is a climb up to High Bowkerstead which views of Satterthwaite village, the surrounding fells and Grizedale Valley. Depending on whether you do the direct or the extended route - this walk is between two and four miles long. Allow one and a half to two and a half hours respectively. To get to Blind Lane Car Park, head south through the village of Satterthwaite. At Force Mills turn east towards High Dale Park and Hawkshead. Blind Lane car park is on the left 200m. There are three circular walks which start at the Bogle Crag car park. As with many of the Forest walks, these walks are a great way to see some of Andy Goldsworthy's famous sculptures. In addition to the sculptures don't forget to look at the ancient beech trees! The walk also takes you through oakwoods which were once used extensively for iron smelting, a potash pit is still visible. Allow around one and a half to two and a half hours for the Bogle Crag trail, which is approximately three miles long. Follow the lilac waymarking signs. To get to the Bogle Crag car park from the Visitor Centre, head south towards Satterthwaite. Take the first left turn - this is about 1 mile south of the Visitor Centre. 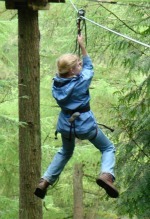 It is not hard to see why this challenging course is one of Go Ape's most popular courses. Fly 200 metres across the top of Grizedale Beck amongst its highlights.